Those clever people at the Dinosaur Toy Forum have compiled a video that displays all the entries for the 2014 diorama competition as sponsored by Everything Dinosaur and what a splendid selection of prehistoric themed scenes have been created. It is certainly going to be a difficult job selecting the winners as there are some wonderful examples of creative use of models and modelling materials. The winning entries will be selected by vote amongst forum members, a very democratic and fair solution, to what would be a tricky task for a judging panel. There is a Cambrian diorama, some splendid Triassic prehistoric animals, marine reptiles, Pterosaurs and plenty of scenes depicting Theropods, team members have enjoyed watching the video and identifying all the replicas contained therein. The prizes have all been put aside in a special area of the Everything Dinosaur warehouse, once winners have been announced we can get these prizes (prehistoric animal models of course), sent out and on their way. Best of luck to everyone involved and we look forward to posting up more news shortly. As we prepare for the 2015 introduction of the Sauropelta dinosaur figure in the Wild Safari Dinos model series (Safari Ltd), our team members have been working on the fact sheet that will accompany sales of this dinosaur model. This large, early representative of that branch of the Ankylosauridae known as the nodosaurids was certainly a spectacular animal. It had four pairs of spines projecting upwards and outwards from the neck and its body armour consisted of rows of bony studs interspersed with small, pebble-like osteoderms. Sauropelta (S. edwardsorum) certainly needed its armour, as it shared a habitat with some very formidable Theropod dinosaurs. As part of Everything Dinosaur’s preparations ,we have commissioned an illustration of this nodosaurid. The drawing will help us to create a scale drawing, to give readers the chance to gauge just how big this dinosaur was. It will also permit us to add “shield lizard” to our large collection of dinosaur drawing materials and downloads. Primitive nodosaurid from the United States. We think our illustration captures the anatomy of Sauropelta quite well, we shall add a human figure to the final drawing to provide scale. One thing that has been pointed out to us, however, both the model and drawing with their small, down-turned snouts look unhappy. Happiness is not an emotional state that is readily applied to the Dinosauria and we certainly should not anthropomorphosize, but perhaps the Sauropelta will look a little happier when these models start being snapped up by collectors and dinosaur fans alike. At Everything Dinosaur we encourage teachers to provide our team members with feedback over our visits to schools to teach about dinosaurs. We conduct dinosaur and fossil workshops from children within the EYFS (Early Years Foundation Stages) right up to students at Key Stage 4. We are keen to develop our work in schools and museums and we are very grateful for all the feedback that we receive. Whilst it would be great if teachers could leave feedback and comments on our dedicated teaching website, we do have a section dedicated to this, we do appreciate that sometimes teaching professionals find themselves so busy that this is not always possible. To help overcome this we always carry feedback forms with us when we visit schools, colleges and other institutions. Being able to provide instant feedback is a great benefit to the teachers, teaching assistants and learning support team members that we work with. Following our visit to Kensington Primary School to work with Foundation Stage children, we got lots of very positive feedback from the teaching team. This feedback has already been posted up on our dedicated teaching website, but we thought it would be helpful if we posted up one of the forms from a class teacher here. 5 Stars for Everything Dinosaur. We note that our “star rating” system was perhaps a little confusing but the comments are greatly appreciated. Our dinosaur expert talked through a couple of extension activities with the teaching team and we look forward to hearing how the term topic develops. Another busy day yesterday for Everything Dinosaur with a visit to Altrincham Preparatory School to work with Year 1. The children, under the enthusiastic tutelage of their teachers Mrs Bacon and Mrs Eyley had been studying dinosaurs and fossils and a visit from our dinosaur expert helped to reinforce learning. One of the pupils in the class heralds from Canada, so it was apt to explore the rib bones of an Edmontosaurus (named after the capital of the Canadian province of Alberta). One of the children in 1E was born in Argentina, so we promised to send out some information on Argentinosaurus, a huge Titanosaur, as part of the extension resources. The children had been busy writing about Diplodocus and our expert was able to see some of the excellent examples of hand-writing, vocabulary use and sentence construction that was on display. A “what I am?” writing exercise with Diplodocus. As part of the experiments we conducted, we showed how Sauropod dinosaurs like Diplodocus fed and then we looked at some fossilised plants and compared them to living ferns. There was also some wonderful artwork on display in the classrooms of 1B and 1E, the children were keen to demonstrate their knowledge and one young dinosaur fan even brought in a model of a Baryonyx. The children and the teaching team really enjoyed the morning and it was great to see so many dinosaur themed examples of work posted up around the classrooms. We even met one little boy called Owen, so we sent over some information on the anatomist Sir Richard Owen who was responsible for naming the group of animals we know as the Dinosauria. Researchers from the Virginia Tech College of Science in collaboration with counterparts from the Chinese Academy of Sciences have published new data on one of the most fundamental and significant changes that occurred in the history of life on our planet. At some time during the Proterozoic Eon, multicellular life forms evolved. These organisms evolved from single-celled entities and in a paper published in the academic journal “Nature”, the researchers propose that multicellular life forms evolved some sixty million years earlier than previously thought. The team suggest that they have found fossil evidence of complex multicellularity in strata dating from around 600 million years ago, although microscopic fossils are known in Precambrian strata from several locations around the world (Australia, South Africa as well as China), this new research is helping to clarify some long-standing interpretations of micro-fossils. It has long been known that simple, multicellular organisms evolved before more complex ones, such as red algae and sponges. If a biological hierarchy existed (and most scientists believe that this is the case), then at some point in the past, single-celled organisms began to evolve into much larger, more complicated multicellular organisms. The trouble is, with the paucity of the fossil record and the difficulties involved in interpreting Ediacaran fauna there is a lot of debate amongst biologists and palaeontologists as to when the solo living cells began to fuse into more cohesive, complex forms. Evidence of multicellular structures in 600 million year old rocks. The researchers examined microscopic samples of phosphorite rocks from the Doushantuo Formation in Guizhou Province (south, central China). This formation represents extensive marine sediments that were deposited from around 635 million years ago to around 550 million years ago. They preserve a unique record of microscopic life (Metazoan life – animals) that existed during the Ediacaran geological period, the period in Earth’s history defined as immediately before the Cambrian and that marks the end of the Precambrian or the Proterozoic Eon. The scientists were able to identify a number of three-dimensional multicellular fossils that show signs of cell-to-cell adhesion, cells potentially performing different functions and programmed cell death. These qualities are all found in complex eukaryotes, the organisms that dominate visible life on Earth to day, the fungi, animals and plants. Eukaryotes range in size from single-celled amoebas to giant sequoias and blue whales. We (H. sapiens) belong to the Domain Eukarya. Eukaryote cells are complex, they have a distinct nucleus surrounded by a membrane. The nucleus contains most of the genetic material. The nucleus itself is a specialised area of the cell, it is referred to as an organelle. Eukaryote cells have a number of specialised areas within them (other organelles as well as a nucleus). Professor Xiao and his colleagues admit that these are not the first multicellular fossils found, nor are they probably the oldest, but the exceptional preservation permits the researchers to draw certain conclusions. For example, it had been previously thought that these multicellular characteristics had started to develop much later in Earth’s history, perhaps as recently as 545 million years ago, a time shortly before the great Cambrian explosion. What was the Cambrian Explosion? The Cambrian explosion refers to the period in Earth’s history around 545 to 542 million years ago when there was a sudden burst of evolution as recorded by extensive fossil discoveries. A wide variety of organisms, especially those with hard, mineralised body parts first appear. This new research may help to shed some light on when multicellularity arose, but the reasons for this significant change remain unclear. The complex multicellularity shown in these Chinese fossils is not consistent with that seen in simpler forms such as bacteria. The scientists note, that whilst some earlier theories can be disregarded these three-dimensional structures can be interpreted in many ways and more research is required to construct the complete life cycle of these ancient organisms. In summary, these fossils may show some affinity towards the stem-groups that led to the first members of the Kingdoms we know as Animalia, Fungi and Plantae, but much more data is needed to establish a more thorough phylogenetic relationship. Everything Dinosaur’s team members are busy with the teaching and other outreach commitments as the autumn term progresses. Yesterday, Everything Dinosaur was working with a primary school in Merseyside, the aim being to help with the term topic (dinosaurs) by providing an interactive and tactile dinosaur and fossil themed workshop. Could we answer the question of the day – Were some dinosaurs huge? One of the objectives that was set in the short briefing with the teaching team prior to the first session was to focus on helping to develop vocabulary and to give the children the opportunity to develop a wider range of describing words. Feedback from Primary School (EYFS). Working with children, some of whom do not have English as a first language and who have only just started school, can be quite a challenge. However, guided by their enthusiastic teachers the children had been undertaking all sorts of exciting exercises and activities to do with dinosaurs and other prehistoric animals. 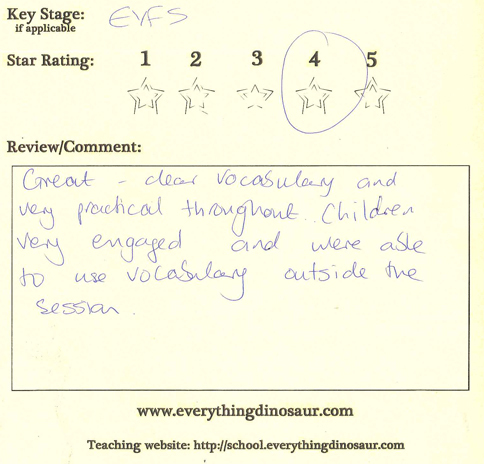 It seems from the feedback received that Everything Dinosaur had indeed, achieved the learning objectives. We suggested a couple of extension activities as a follow up to some of the work undertaken in the actual dinosaur themed workshop and we look forward to hearing how the children fared as they explore all things dinosaur! Today, is the official first day of autumn in the United Kingdom. Although our team members spend most of their waking hours discussing the concept of “deep time”, this year seems to have simply whizzed by. Soon it will be Christmas (just ninety-two days to Christmas, or so we have been reliable informed). Therefore it is a good time to reflect on our social media targets that were set at the beginning of the year. On January 8th 2014, Everything Dinosaur staff set out a list of objectives with regards to the company’s social media activities, this list was updated and reviewed again in June. Social media can be used for many purposes, we like to pass on helpful tips and advice to our customers. We also like to post up articles about new dinosaur and fossil discoveries, museum exhibitions, competitions that we run, support schools and teachers and generally engage in two-way communication with our many friends and supporters across the world. Our team members set targets at the start of the year, let’s see how we are doing. This is our favourite platform, although Twitter is catching up fast. Thanks to all those people who have entered our competitions and sent us various drawings and pictures, we have enjoyed seeing these items as they have been posted up onto our Facebook wall. In terms of “likes” we had a target of 1,200 by the end of 2014, so far we have over 1,265 “likes”. We are grateful to everyone who has liked our page. Should we set a new target, how about an additional 100 “likes” by the end of the year? We love the immediacy of Twitter and we have really enjoyed “Tweeting” to our many friends and fans. It has been great to correspond with so many helpful, intelligent people and to swap ideas and updates. So far we have tweeted 1,670 times and we have 255 followers and we are following 278, not many but not too bad considering all the work we do in schools and our other activities. As of this week, our Pinterest figures look like this – 4,639 pins with 130 pins on our Dinosaur Party board with a further 143 pins on our commercial board “dinosaur themed gifts”, 570 followers and 495 following. Everything Dinosaur has already surpassed a number of Pinterest targets for the year, perhaps a total of 5,200 pins by the end of December? Our web log (this site) is quite big, we are on target to have 2,800 articles on line by the end of the year, we should really post up on our social media platforms that we have passed 2,750 so far. We try to put up an article, a news story or feature every single day of the year. We set ourselves an additional target of 1,125 verified comments by the end of 2014, so far we have logged over 1,080, perhaps over the next few months we can achieve our comments target. In addition, we have also spring cleaned (if that is the right term) our blog site, we have added a site map put up those blog articles that were lost when we upgraded systems and made sure that the archive was up to date. Not too bad then. Our video reviews have proved to be very popular, we are very appreciative of all the kind words and positive comments that we have received. We wanted to upload a number of video reviews of new models this year, we have still got a few to do but we have 90 videos on line at the moment. We set a target of 800,000 video reviews by the end of the year, it looks like that target is going to be exceeded as we have got 797,000 video views to date, perhaps we should set a new target of 900,000 by December 31st 2014. Our subscriber numbers continue to increase we have over 1,030 at the moment. We are truly grateful for all the comments, suggestions, feedback, unboxing videos, likes that we receive etc.. We can’t stress enough how important they are to us. In addition to all our social media activities, we have been able over the last month or so, to establish a bespoke website aimed at helping teachers, learning support providers and homeschoolers teach about dinosaurs and fossils. This new site contains lots of free resources to help this teaching work, as well as articles, features and advice from other teaching professionals. Thanks to the support that we receive on our social media platforms we have been able to introduce this new website. Teaching tips, articles, resources and free downloads. Our thanks to everyone who has helped us on our journey. Safari Ltd have provided Everything Dinosaur with information in regards to this company’s new prehistoric animal models scheduled for release in 2015. As with the trend in recent years, the number of Wild Safari Dinos introductions outnumbers those in the Carnegie Collectibles, scale model range. One new addition is being added to the Carnegie Collectibles series, a model of a feathered Velociraptor. Estimated to be in approximately 1:50 scale the Velociraptor model measures a little over 19 cm in length and the model is a fraction under 8 cm tall. The other prehistoric animal models that are due out next year are all part of the not-to-scale Wild Safari Dinos model range. The introductions consist of a feathered Yutyrannus, the horned dinosaur Nasutoceratops, an Archaeopteryx figure and a model of the armoured dinosaur known as Sauropelta. The Yutyrannus model measures 20 cm long and is about the same height as the Velociraptor figure discussed earlier, just under 8 cm tall. A beautifully crafted figure that keeps up the company’s proud tradition of introducing at least one horned dinosaur model each year. The Nasutoceratops measures 17 cm in length and stands 6 cm high. To read Everything Dinosaur’s article on the discovery of “large nose, horned face”: Nasutoceratops Article. Next, we have a replica of Archaeopteryx, a replica painted to reflect some of the latest scientific thinking about “ancient wing” or Urvogel, as the Germans like to call it. The model is quite large, it is just under 10 cm high and the wing span is around 10 cm too. What a fantastic model it is. Due to land at Everything Dinosaur next year. Last but not least, is the wonderful replica of Sauropelta. At Everything Dinosaur we just love our armoured dinosaurs and we look forward to receiving this model into our range early in 2015. At Everything Dinosaur, we supply Safari Ltd models with our own prehistoric animal themed information sheet. Scale drawings have already been commissioned for all these models, just to whet your appetites, here is the finished drawing of the basal tyrannosaurid Yutyrannus. A team of researchers from Brigham Young Museum of Palaeontology and North Carolina State University (North Carolina Museum of Natural Sciences) have described a new type of duck-billed dinosaur, one with an enormous “conk”. Duck-billed dinosaurs are well-known for sporting elaborate crests, even combs after recent research into the Edmontosaurus genus, but roaming the estuarine habitat of Utah around 75 million years ago was Rhinorex, a duck-billed dinosaur whose genus name translates as “Nose King”. “King Nose” is surprised by a Cretaceous crocodilian. Terry Gates, a post-doctoral researcher with North Carolina Museum of Natural Sciences and North Carolina State University, collaborated with Rodney Scheetz (Brigham Young), to analyse the skull of a specimen that had been excavated from the Book Cliffs area of east-central Utah in the 1990’s. This strata forms part of the Neslen Formation which consists of a series of sedimentary layers of rock representing both marine and terrestrial environments. The specimen had been studied as associated with the fossil skull bones, were some very well preserved skin impressions. However, it was only when the scientists constructed the skull that they realised they had a new species on their hands. Although the skeleton is far from complete, unique morphologies of the skull indicate that this is a new species of duck-billed dinosaur, a member of the Hadrosauridae family. The dinosaur has been named Rhinorex condrupus. The name translates as “king nose buried in the cliffs”, the genus name makes reference to the unique shape of the nasal bones and premaxilla. These bones indicate that this plant-eating dinosaur had a large, fleshy nose. Whilst it is difficult to estimate the exact size of this dinosaur from the fossil bones that have been collected, comparisons with the closely related Gryposaurus and Kritosaurus give a maximum length of around nine metres, with a body weight in excess of three tonnes. The sandstone sediments represent a low lying, swampy, estuarine environment and to date, Rhinorex is the only substantial Hadrosaur fossil known from this locality. In essence, “King Nose” helps to fill a gap in the hadrosaurid family tree. Many different types of duck-billed dinosaur existed during the later years of the Cretaceous, scientists have found fossils of hadrosaurids in almost all the Upper Cretaceous fossil bearing terrestrial formations in western North America. Although the vast majority of these fossils are far from complete, they suggest that the varied Hadrosauridae family evolved as each genus occupied a relatively small geographical area. The line drawing shows the reconstructed skull from the fossil bones (scale bar 10cm). The line drawing (A) is labelled with the autapomorphies (unique characters or traits) that distinguish this dinosaur as a new genus, namely the hook-like structure (nap) nasal anteroventral process and the expansion of bone located posteroventrally on the premaxilla (ppd). Why Such a Big Nose? The large and fleshy snout remains a bit of a puzzle. It may not be related to an enhanced sense of smell. It certainly would have looked a little odd with its enlarged naris. However, when you consider the weird and wonderful Saurolophines, Parasaurolophus with its enormous, backward sweeping head crest, Edmontosaurus with a fleshy comb on its head and Tsintaosaurus which may have superficially resembled a unicorn, then we think Rhinorex would have fitted right in.